Fermilab issued the following press release July 20. Scientists of the CDF collaboration at the Department of Energy’s Fermi National Accelerator Laboratory announced the observation of a new particle, the neutral Xi-sub-b (Ξb0). This particle contains three quarks: a strange quark, an up quark and a bottom quark (s-u-b). While its existence was predicted by the Standard Model, the observation of the neutral Xi-sub-b is significant because it strengthens our understanding of how quarks form matter. Fermilab physicist Pat Lukens, a member of the CDF collaboration, presented the discovery at Fermilab on Wednesday, July 20. Although Fermilab’s Tevatron particle collider is not a dedicated bottom quark factory, sophisticated particle detectors and trillions of proton-antiproton collisions have made it a haven for discovering and studying almost all of the known bottom baryons. Experiments at the Tevatron discovered the Sigma-sub-b baryons (Σb and Σb*) in 2006, observed the Xi-b-minus baryon (Ξb-) in 2007, and found the Omega-sub-b (Ωb-) in 2009. The lightest bottom baryon, the Lambda-sub-b (Λb), was discovered at CERN. Measuring the properties of all these particles allows scientists to test and improve models of how quarks interact at close distances via the strong nuclear force, as explained by the theory of quantum chromodynamics (QCD). Scientists at Fermilab and other DOE national laboratories use powerful computers to simulate quark interactions and understand the properties of particles comprised of quarks. Once produced, the neutral Xi-sub-b travels a fraction of a millimeter before it decays into lighter particles. These particles then decay again into even lighter particles. Physicists rely on the details of this series of decays to identify the initial particle. The complex decay pattern of the neutral Xi-sub-b has made the observation of this particle significantly more challenging than that of its charged sibling (Ξb-). Combing through almost 500 trillion proton-antiproton collisions produced by Fermilab’s Tevatron particle collider, the CDF collaboration isolated 25 examples in which the particles emerging from a collision revealed the distinctive signature of the neutral Xi-sub-b. The analysis established the discovery at a level of 7 sigma. Scientists consider 5 sigma the threshold for discoveries. CDF is an international experiment of about 500 physicists from 58 institutions in 15 countries. It is supported by the U.S. Department of Energy, the National Science Foundation and a number of international funding agencies. Fermilab is a national laboratory funded by the Office of Science of the U.S. Department of Energy, operated under contract by Fermi Research Alliance, LLC. 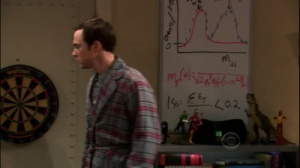 An astute viewer of the Big Bang Theory TV show from the school of physics at Georgia Tech noticed that the white board in Leonard and Sheldon’s apartment had on it a plot for a result from the CDF experiment at Fermilab. The image of the plot from the episode was posted on the school’s Facebook site and later the Internet. And not just any plot. The plot. The one that has caused debate in the blogosphere and media and put the Tevatron’s two collider experiments at odds. April 7 CDF announced it had seen an unexpected spike in its data, “a bump” as physicists call it, that potentially could signal a new particle or force, but more data was needed to know for sure. Science lovers jumped at the news and speculations about what this could mean abounded. Discussions took a turn when DZero’s results released June 10 found no such bump. The experiments will continue to analyze larger data sets and compare data until “the bump” is verified or disputed beyond a doubt. So stay tuned. I’m sure the Big Bang Theory writers will. George Smoot (in Sheldon's seat, no less!) on the set of Big Bang Theory. Photo courtesy of George Smoot. Scientists help advise the show’s writers, and the show has a history of making references to current experiments or leaders in the field. ﻿And sometimes physicists even make cameos. 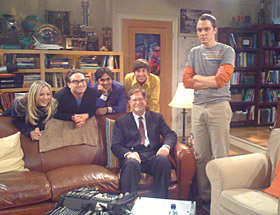 In 2009 Nobel laureate George Smoot, professor of physics at the University of California, Berkeley, research physicist at Lawrence Berkeley National Laboratory, and a confessed fan of the show, agreed to appear in the episode. The show averages about 9 million viewers a week but not all physicists are fans. In a symmetry magazine article Jennifer Ouellette Science blogger and author of the Buffyverse came her critique of the show and the high-energy physics communities reaction to it. Personally I think the community should embrace the program. I think the public is smart enough to recognize the stereotypes and formulaic dating plots for what they are and not a documentary-type representation of physicists. Plus the show exposes people to the science, which is never a bad thing. I have met many people who had never heard of particle physics prior to watching the Big Bang Theory or reading “Angles and Demons”. While not all of these people were enticed to learn more about particle physics, some were, and no one came away with a negative view of the science. The DZero collaboration found its data for the production of a W boson and two jets to be in agreement with the predictions by the Standard Model. The red peak below 100 GeV/c2 is a well-known Standard Model feature of the decays of W and Z bosons. If the CDF excess is interpreted as a new particle, the dotted line shows what such a particle would look like in the DZero detector. The DZero data shows no excess around 145 GeV/c2. This article first appeared in Fermilab Today June 10. Two months ago, CDF scientists reported an unexpected excess of proton-antiproton collisions that produce a W boson accompanied by two jets of particles. One possible explanation for the excess could be the existence of a new, unanticipated particle. Now the DZero collaboration has finished an independent analysis that tests the CDF result. Following the analysis procedure employed by CDF as closely as possible, DZero scientists did not find the same excess in the data. The collaboration will report its result and the details of its analysis at 4 p.m. today at a seminar at Fermilab. Over the last 10 years, CDF and DZero have published more than 500 measurements of particle physics processes using two different particle detectors and independent analysis tools. The results agree more than 99 percent of the time, but there are rare occasions that the findings differ. Now that the independent analyses have been completed, the difference between the two experiments’ results must be understood and resolved. Fermilab Director Pier Oddone and the CDF and DZero collaborations have agreed to create a task force that will coordinate a study of the two experiments’ analyses. The task force will consist of members from both experiments and Fermilab theorists Estia Eichten and Keith Ellis. Today’s seminar will take place at 4 p.m. in Ramsey Auditorium and will also be webcast. The DZero paper has been submitted to Physical Review Letters, and a copy is available at the collaboration’s website. The CDF paper is available at their website. Bump in data: Could it signal a new particle or force? Wednesday afternoon, the CDF collaboration announced that it has evidence of a peak in a specific sample of its data. The peak is an excess of particle collision events that produce a W boson accompanied by two hadronic jets. This peak showed up in a mass region where we did not expect one. 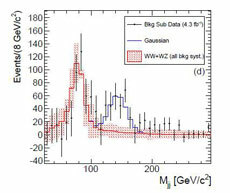 The peak was observed in the 140 GeV/c2 mass range, as shown in the plot above. It is the kind of peak in a plot that, if confirmed, scientists associate with the existence of a particle. The significance of this excess was determined to be 3.2 sigma, after accounting for the effect of systematic uncertainties. This means that there is less than a 1 in 1375 chance that the effect is mimicked by a statistical fluctuation. Particle physicists consider a result at 5.0 sigma to be a discovery. The excess might be explained by the production of a new, unknown particle that is not predicted by the Standard Model, the current standard theory of the fundamental laws of physics. The features of this excess exclude the possibility that this peak might be due to a Standard Model Higgs boson or a supersymmetric particle. Instead, we might see a completely new type of force or interaction. A few models proposed and developed in recent years postulate the existence of new fundamental interactions beyond those known today, which would create an excess similar to the one seen in the CDF data. That’s why everybody at CDF is excited about this result. The alternative explanation for this excess would be that we need to reconsider the theory that is used to predict the background spectrum, which is based on standard particle physics processes. That possibility, albeit less glamorous, would still have important implications. Those calculations use theoretical tools that are generally regarded as reliable and well understood, and form the basis of many other predictions in particle physics. Questioning these tools would require us to challenge our understanding of the fundamental forces of nature, the foundation of particle physics. The current analysis is based on 4.3 inverse femtobarns of data. The CDF collaboration will repeat the analysis with at least twice as much data to see whether the bump gets more or less pronounced. Other experiments, including DZero and the LHC experiments, will look for a particle of about 140 GeV/c2 in their data as well. Their results will either refute or confirm our result. Our result has been submitted to Physical Review Letters. You can read the paper and watch the lecture online. It remains to be seen whether this measurement is an important indication of long-awaited new physics beyond the Standard Model. Several interesting articles have been written about the result. Media interest was generated after a thesis article was spotted in an academic journal. Gordon Watts has an intriguing blog post about how the release of scientific information is and could be affected by today’s fast-paced, Internet-driven society. This could bring people into the scientific process before an analysis has been fully vetted or enough data has been complied and analyzed to declare something a discovery by reaching the 5-sigma threshold. Do you think that is a good or bad thing? 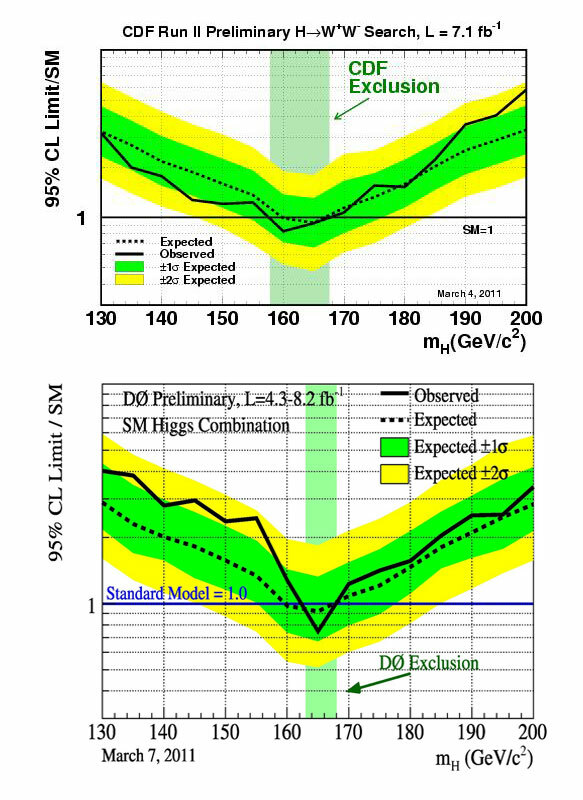 The top (CDF) and bottom (DZero) images show the expected and observed 95 percent confidence level upper limits on the production rate of a Higgs boson as a multiple of the Standard Model prediction, assuming standard model decay branching ratios. 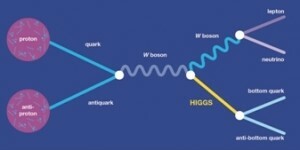 The solid, horizontal line shows the prediction for the Higgs boson according to the Standard Model. We determine our measurement by how our data relates to this solid line. The figures have two squiggly lines: one dotted and one solid. The dotted line shows what we expected to measure and is surrounded by a bright green band. The band shows how certain we were in our prediction. The best way to interpret this is that the bright green region shows the area where we predicted our measurement should be. This article ran in Fermilab Today March 17. The Standard Model of particle physics needs the Higgs mechanism to explain why all the particles in our universe have mass, but no experiment has yet observed the elusive Higgs boson. Answering the question of whether the Higgs mechanism is correct or whether something else is responsible for the masses of particles is central to our understanding of nature. 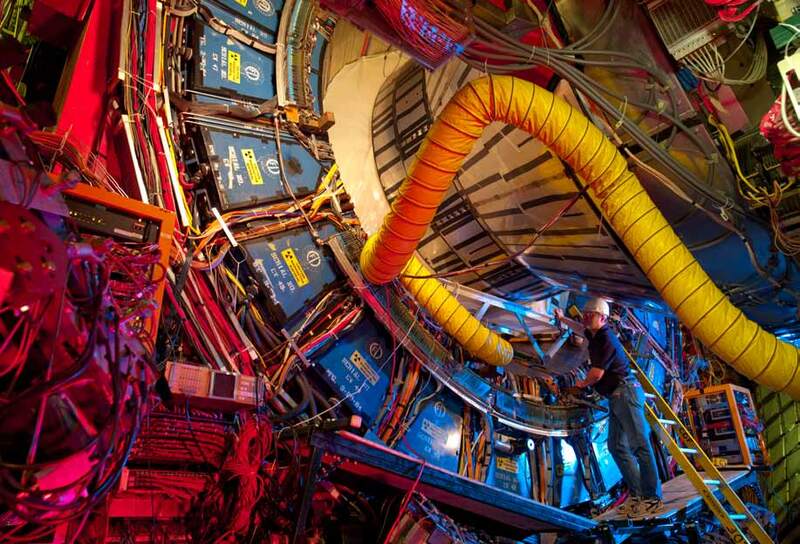 Many physicists around the world have spent decades searching for the Higgs boson. This week, a crucial step forward in this quest has been made by the CDF and DZero experiments. All recent Higgs boson mass exclusions have come from combinations of results from more than one experiment. Despite the importance of such combined statements, it is an important milestone when a single experiment reaches the level of sensitivity necessary to rule out or see the Higgs boson. Late last week, the CDF and the DZero experiments crossed this threshold individually. The CDF and DZero experiment collaborations recently updated their Higgs boson searches in the high mass range (130 to 185 Gev). In this range, the Higgs boson mass is high enough to allow it to decay to a pair of W bosons. Together, the Tevatron experiments put to good use an additional 1.5 inverse femtobarns of data collected since their joint result from last summer, and added several new improvements to their analysis techniques. The new data and improvements have allowed both Tevatron experiments to exclude a portion of the Higgs boson mass range: 158 to 168 GeV for CDF and 163 to 168 GeV for DZero. The CDF and DZero experiments have also combined their results; the region thus excluded is 158 to 173 GeV. A Higgs boson of mass 165 GeV is now excluded at the unprecedented level of more than a 99.5 percent confidence level. 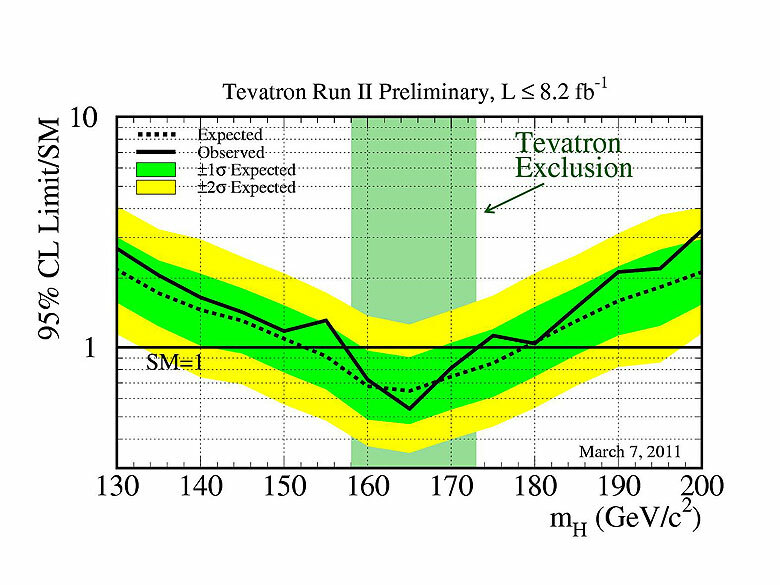 Fermilab currently expects the Tevatron to keep recording data until September 2011. CDF and DZero are also ideally suited to look for the Higgs boson in the low mass range, where the Higgs would decay mainly into bottom quarks. CDF and Dzero expect to present new results in this search region later this year. This large data sample, along with expected analysis improvements, will allow the experiments to either exclude the Higgs boson over the entire mass range of interest if it does not exist or to see hints of it – representing a major breakthrough in our understanding of nature. This article ran in Fermilab Today March 14. Improved analysis techniques and more data have made the Tevatron experiments more sensitive to the Higgs boson. 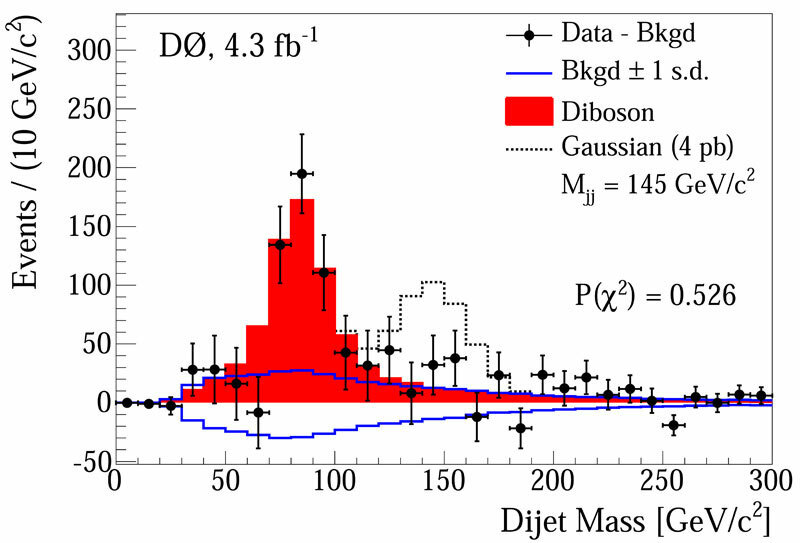 CDF and DZero exclude a significant portion of the high-Higgs-mass range. The CDF and DZero experiments at Fermilab have reached new ground in their quest to find the Higgs boson, a key member of the particle zoo known as the Standard Model. For the first time, each experiment by itself excludes regions of the expected Higgs mass range as more sophisticated data analysis techniques and more data from the Tevatron particle collider have increased their sensitivity to the Higgs boson. This week, the two collaborations, each comprising about 500 scientists, will present details of their results at conferences and seminars around the world, including the Rencontres de Moriond in Italy. The Tevatron, four miles in circumference, is the world’s highest-energy proton-antiproton collider. Searches by previous experiments and constraints due to precision measurements of the Standard Model of Particles and Forces indicate that the Higgs particle should have a mass between 114 and 185 GeV/c2. (For comparison: 100 GeV/c2 is equivalent to 107 times the mass of a proton.) The CDF and DZero experiments are now sensitive to excluding Higgs bosons with masses from 153 to 179 GeV/c2. Statistical fluctuations in the number of observed particle collisions that mimic a Higgs signal, mixed with collisions that may have produced a Higgs boson, affect the actual range that can be excluded with 95 percent certainty. Combining their independent Higgs analyses, the two experiments now exclude a Higgs boson with a mass between 158 and 173 GeV/c2. The recording of additional collisions and further improved analysis of data will reduce the size of the statistical fluctuations and, over time, could reveal a signal from the Higgs boson. 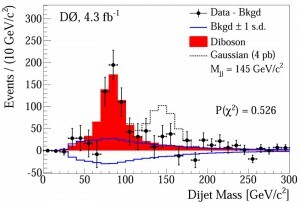 For the present data analysis, CDF and DZero scientists concentrated on the search for a high-mass Higgs boson that has a mass heavier than 130 GeV/c2. But the Tevatron experiments also continue to look for a low-mass Higgs boson. In this case, the Higgs boson decays mainly into bottom quarks, which would create a different pattern in the CDF and DZero detectors than the decay products of a high-mass Higgs. Combined the Tevatron experiments now are sensitive to a Higgs mass from 153 to 179 GeV/c2, but statistical fluctuation reduce the actual mass range that can be excluded so far. For the first time, the experiments now also exclude Higgs mass ranges individually (see CDF and DZero graphics). CDF kicked off the new year with the paper “CDF Finds Evidence for a Mass Dependant Forward-Backward Production Asymmetry of Top Quarks”, which has drawn some interest in the blogosphere. The analysis itself is intriguing. 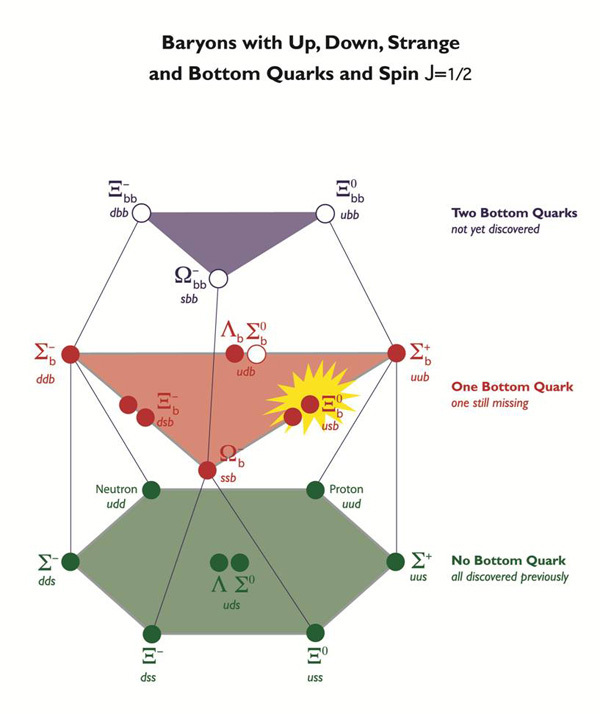 Physicists expect to see the number of top quarks and antitop quarks produced along the beam line to meet with Standard Model predictions of nearly equal amounts. But, CDF isn’t seeing that. The collaboration sees more top quarks along the proton direction and fewer top quarks produced along the antiproton direction. CDF co-spokesman Rob Roser explains the analysis nicely in the article below. But the really intriguing part is what this could all mean. It could signal a hint of new physics not predicted by the Standard Model. Bloggers at Resonaances and Nature speculate on possible causes for the asymmetry. It could also be nothing more than an anomaly. In the patience-trying nature of particle physics, we will have to wait for more data to know for sure. Fortunately, CDF’s sister detector at the Tevatron, DZero, can do a complimentary analysis, widening the data set. Until that occurs, check out the analysis yourself below. The article below ran in Fermilab Today January, 7. A new analysis that will be presented at a Wine and Cheese lecture at Fermilab today points to an asymmetry in top quark production. This analysis raises the asymmetry of forward and backward top quark production found in a 2008 analysis to a ~3 sigma level. In nature, symmetry is seen as pleasing and balanced designs, such as the intricate pattern on a tortoise shell or the structure of a snowflake. In elementary particle physics, symmetry is fundamental to the theories we use to describe the world in which we live. A discrepancy in the symmetry predicted by theories of the Standard Model can point to new types of physics, an anomaly in the data or that the current theories need revision. CDF researchers have measured the symmetry of how top quarks emerge from collisions, forward or backward, and how they decay. This analysis was performed for the first time in 2006 at CDF. CDF and DZero both published their inclusive analysis of this asymmetry in 2008. These highly cited white papers already pointed to an anomaly that has generated much interest in the theoretical community. This latest result takes the 2008 publications a step further, by adding more data, and looking at the dependence on the mass of the system. It is this dependence that is most discrepant with the Standard Model. Fermilab’s Tevatron produces collisions that create top quark and anti-top-quark pairs via the strong force. Simple theoretical calculations predict that the Tevatron detectors should observe symmetric distributions of both top and antitop quarks. However, more detailed calculations suggest that these oppositely charged particles should have a slight preference as to how they emerge from the collisions. The origins of this symmetry are subtle, but CDF has the sensitivity to be able to observe the 6 percent imbalance, which is predicted by the Standard Model. This result shows that nature prefers an imbalance that is even larger than predicted. It is important to determine whether the top quark we are observing behaves the way we expect this Standard Model object to act. There are a number of Beyond-the-Standard-Model theories such as Z’ (pronounced Z-prime) and large extra dimensions that predicts much higher asymmetries. By measuring this asymmetry in top quark production, CDF physicists can compare it to theoretical expectations and probe for potentially undiscovered new physics. The figures show the number of top events as a function of delta rapidity. The blue shape is that of the background, the green is the Standard Model prediction for top, and the points are our data. The plot on the left contains events in which the ttbar mass is less than 450 GeV/c2 and is very symmetric. The plot on the right is for a ttbar mass of greater than 450 GeV/c2 and illustrates the discrepancy between expected and observed. Utilizing 5.3 inverse femtobarns of data, CDF measured the top forward backward asymmetry and observed significant asymmetries when studying the production and the production as related to the pairs’ center of mass energy, t-tbar. When considering the pairs’ mass, the asymmetry is dependent on both the mass and the direction of the production. Scientists expect that the same number of top quarks and antitop quarks would be produced along the beam line, but CDF saw that more tops were produced along the proton direction of the beam and fewer tops produced along the antiproton direction of the beam. 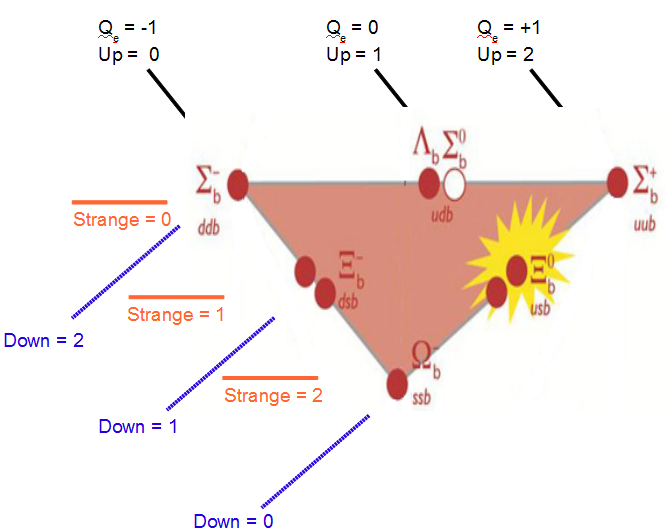 This effect is magnified when one looks at the mass dependence of the top-antitop system. For Mttbar> 450 GeV/c2the asymmetry is measured to be 48 ± 11 percent, three standard deviations from Standard Model expectation (9 ± 1 percent). Some theories suggest that such a mass dependence could be evidence of a massive new particle just out of reach at the Tevatron’s collision energy. The LHC, a machine with significantly higher energy, cannot easily study this phenomenon, since the LHC does not make protons and antiprotons collide. However a new particle would still be observable in energy spectrum at the LHC. If the result at CDF truly is a sign of new physics, it may be that both machines will be required to understand its nature. This result may provide the first important clue that there is new physics beyond the Standard Model. There may still be other interesting results as scientists from both Fermilab experiments continue to analyze the Tevatron’s now nearly 10 inverse femtobarns of sample data.